The memorial consists of a rectangular bronze plaque attached to a large irregular shaped boulder standing several feet tall. The plaque dedication was part of the closing ceremony for the North Carolina Daughters of the American Revolution annual convention held in Asheville in 1936. The 2013 rededication ceremony featured the DAR color guard, complete with piccolo and snare accompaniment. Asheville Mayor Terry Bellamy remarked that she was glad not to be mayor of “Morristown,” the name by which Asheville was originally known. 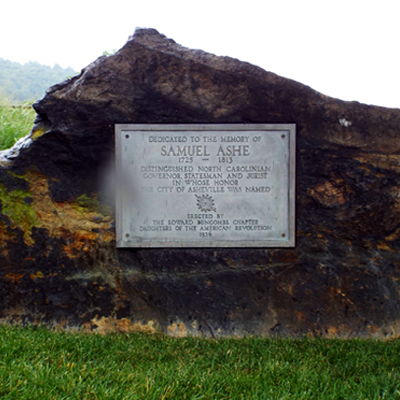 In 1797 the small Buncombe County community of Morrisville was incorporated and renamed Asheville in honor of Samuel Ashe. 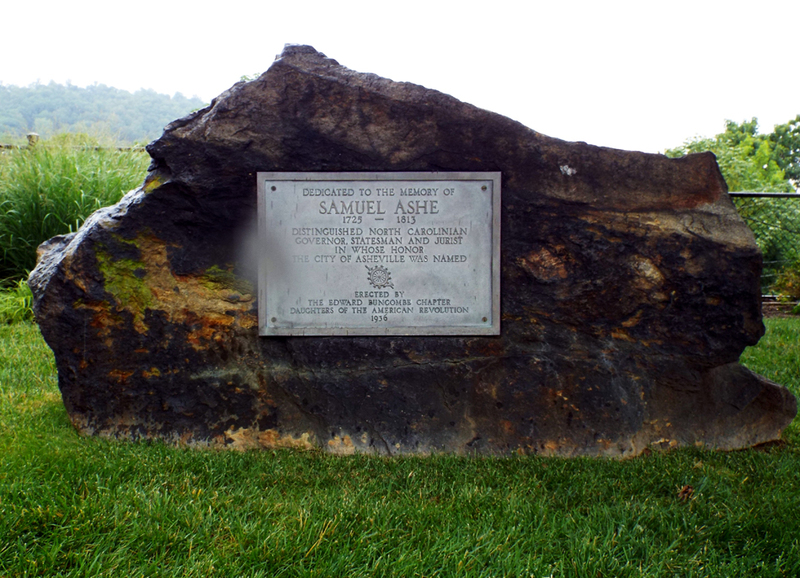 Ashe was a prominent figure in North Carolina history leading up to and during the American Revolution. The marker is located southeast of the courthouse, off the Court Plaza and north of Marjorie St. It faces Pack Square Park which is across the street. In the immediate area of the old Buncombe County Courthouse there are other notable plaques, monuments and memorials: Western North Carolina Veterans Memorial, 60th North Carolina Regiment, Revolutionary War, Spanish American and other wars, Police and Firemen who died in the line of duty, and Medal of Honor recipient Lt. Colonel Robert Morgan. Several hundred yards to the west stands the monument to Zebulon Vance and several other small markers. The marker stands on the grass with a spectacular view of the backdrop of mountains.